The inspiring 'Minds run free' article in The Psychologist highlighted the mental and physical challenges of running and the additional psychological benefits it can bring. 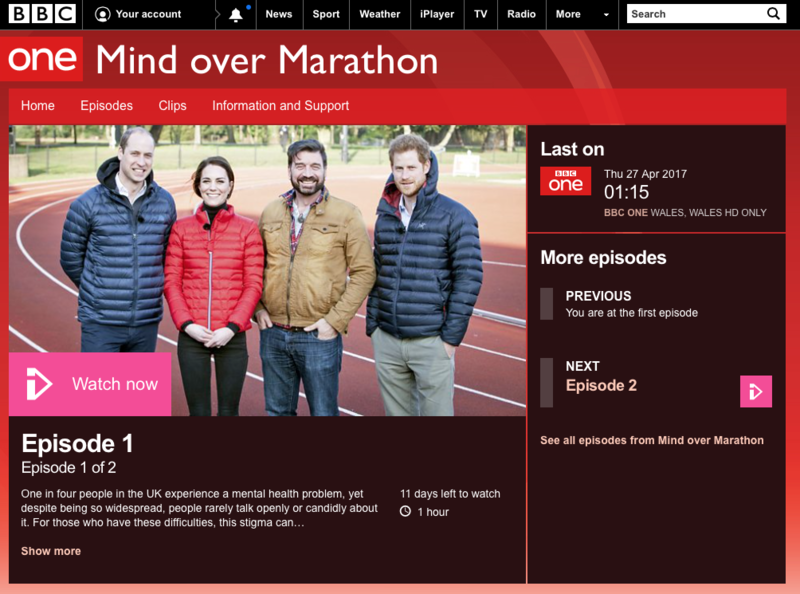 This was perfectly portrayed in the two-part BBC documentary 'Mind over Marathon' in which we follow the journey of 10 individuals, all of whom experience mental health difficulties, in training for a marathon. The runners are given 20 weeks to train from beginner level to marathon runner. The aim of the documentary is to demonstrate that exercise can help with mental health issues, but the runners also had their own goals: to reduce stigma, learn new coping strategies, to spread awareness and to speak out without judgement. All the runners experience depression amongst other difficulties, such as PTSD, anxiety and OCD. They discuss factors contributing to their difficulties (bereavement, road accident, bullying and postnatal depression), reflect on the battles they face on a day-to-day basis, such as going to the supermarket, and also some of the consequences of their symptoms, such as not feeling able to engage due to low mood. The challenges the runners face, both physically and mentally, are represented throughout their 20-week journey. The difficulty of these challenges was sometimes reflected in the runner’s engagement, with some individuals withdrawing due to injuries or low mood. The support team emphasised that asking for support with mental health is not a weakness and this was likened to getting support for a physical injury. Regardless of the difficulties each individual faced, the coaches encouraged them to not perceive it as giving up, encouraging small steps instead. They got back on track with team’s 'collective will to succeed'. The benefits of running on mental health were again emphasised as the runners described improvements in their self-esteem, increased confidence and a greater sense of worth. During the documentary, the runners also received input from the Royal Family, who are spearheading the charity ‘Heads Together’ to reduce stigma around mental health. The royals spoke to individuals about their experience of mental health difficulties and highlighted the importance of early intervention. Prince William reflected on personal issues and emphasised the importance of discussing emotions and validating people’s difficulties in relation to what they have experienced. Watching the day of the marathon evokes strong emotions as you see 7 of the 10 individuals begin and complete the London Marathon. Each runner shows amazing strength of character and, as a team, they achieve a variety of successes – from overcoming anxiety in crowds, completing the hardest physical challenge of their life and feeling proud of themselves. The support they gave each other shone through, along with the will from each individual to face the challenges in front of them. Viewers get a very raw account of someone living with mental health difficulties and, therefore, an opportunity to develop understanding and reduce stigma. 'Running and mental health are really good companions', concludes one of the coaches. - Watch the programmes now.